I participated in the Cathedral Ministries Conference last week. It was held in Santa Fe New Mexico. The liturgies were rich and beautiful, with excellent music and preaching and elements of local culture interwoven skillfully with the strong yet simple structure of the Roman Rite. Adults, children, and youth all exercised liturgical ministries with great presence that suggested they knew exactly what they were doing. One felt we were all engaged in something sacred—a common act of worship which unfolded through diverse roles. There are a significant number of Native American Pueblos in the Archdiocese (I do not know the exact number, but I am told that Latino and Native American Catholics together amount to 85% of the Archdiocese). Efforts have been made in the Pueblos to cultivate a spirituality that is both truly Native American and truly Catholic. I should not have been surprised, therefore, that in one of the liturgies a group from one of the Pueblos did a Sacred Buffalo Dance as a post-communion prayer of thanksgiving. 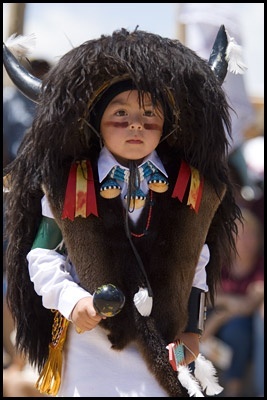 Their ceremonial dress (buffalo hoods, eagle feathers, clothing of white and brightly colored cloth), the sounds of drum and chanting, plus the dance itself (marked by the rhythmic sound of bells worn by the dancers on bands around their waists, wrists and ankles; similar to the zils of a tambourine) made a deep impression on this Northeasterner, because they were – quite literally -- like something from another world. Most impressive of all was the attitude of the dancers themselves: completely serious and focused, from the tiniest child (a small girl of about six years old) to the oldest adult. This wasn’t Hollywood or show time or even the folk festival. It was prayer and witness, an offering before God that we were invited to share as brothers and sisters in Christ. Knowing how often and how brutally Native Americans have been betrayed over the centuries, I felt the shock of recognizing how, even now, this is the America most of us do not know or see. Yet here they are. And their worship is a gift of inestimable value before God, who is always near to those who call upon him. My talk was on liturgy and social justice—how the liturgy calls us to justice, and how God calls us to worship him in a way not corrupted by favoritism. When I got home, I did a little web search about the buffalo dance and, alas, I soon discovered (some) Catholics sitting in judgment, sure that European liturgical forms are normative and indeed the only forms capable of bearing authentic worship of the Triune God. Fortunately, the Vatican II Constitution on the Sacred Liturgy (Sacrosanctum Concilium) takes a different view. I was a guest of the Church of Santa Fe this week. I came home to different people and different challenges. Yet the experience renews the question we all face in various ways: Who is the Body of Christ? How do we keep the “solemn promise” of our worship?